Sega's deceased portable makes a comeback. Does that make it a zombie? Today's Nintendo eShop update brings a trio of titles from Sega's Game Gear, the 90s portable that attempted and failed to unseat the old black and white Game Boy. 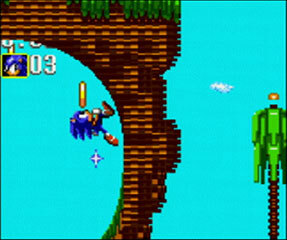 Players will be able to download Sonic the Hedgehog: Triple Trouble ($4.99), Shinobi ($3.99) and the RPG, Dragon Crystal ($2.99). Not sure why Sonic's more expensive. Probably has something to do with charging users a premium simply because it's Sonic, but that would be quite dastardly, no? In addition, Nintendo will unleash the first of three Kid Icarus 3D animes. This one comes from famous studio Production I.G, the same group behind the hit movie Ghost in the Shell: Stand Alone Complex. Finally, there's Pirates Assault for DSiWare, along with Samurai Showdown IV: Amakusa's Revenge for the Wii's Virtual Console.